This section contains instructions on setting up the Swordfish Target Platform produced by the headless build. For more information about Swordfish headless builds, see Creating a headless build. Eclipse Galileo (Eclipse 3.5) build or later. The examples described here are based on Eclipse 3.5. Add the location (path) of the built Swordfish plug-ins to the list of locations presented in the definition. Add to the platform definition location of Equinox the bundles that are necessary to run the target platform. When the build process successfully ends, you can find these bundles in the platform directory of org.eclipse.swordfish.build project. Go to the Content tab and select the bundles listed in c: as shown in this figure. This means that all bundles from the target platform as well as the Eclipse Equinox bundles must be selected. 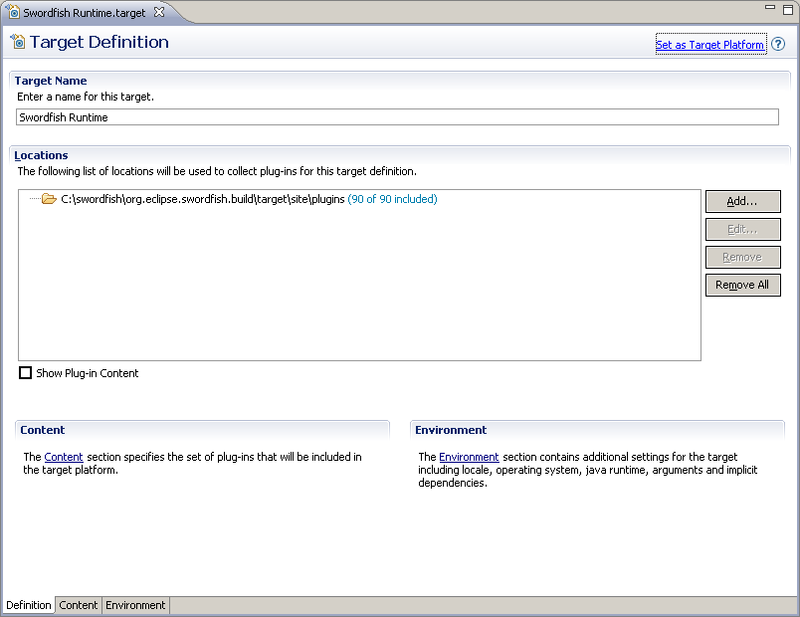 Configure Eclipse to use the Swordfish target platform. 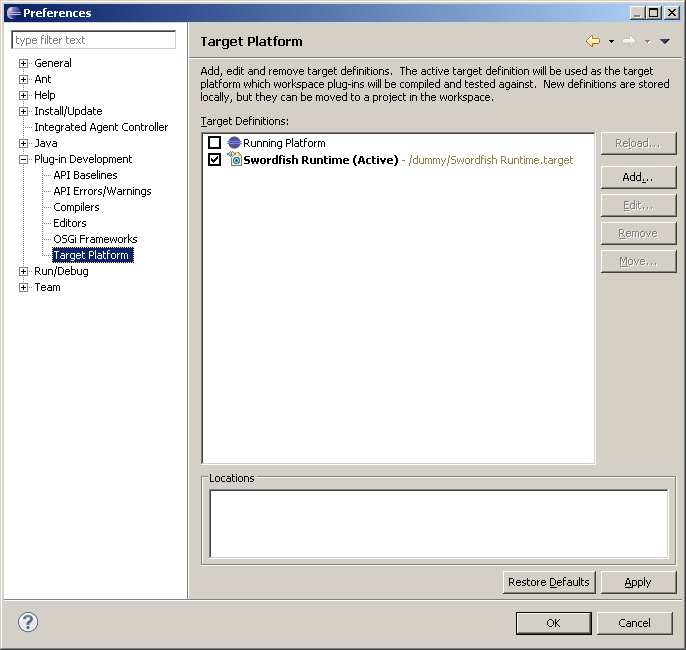 Click Window > Preferences > Target Platform and set the newly created definition as active target platform. 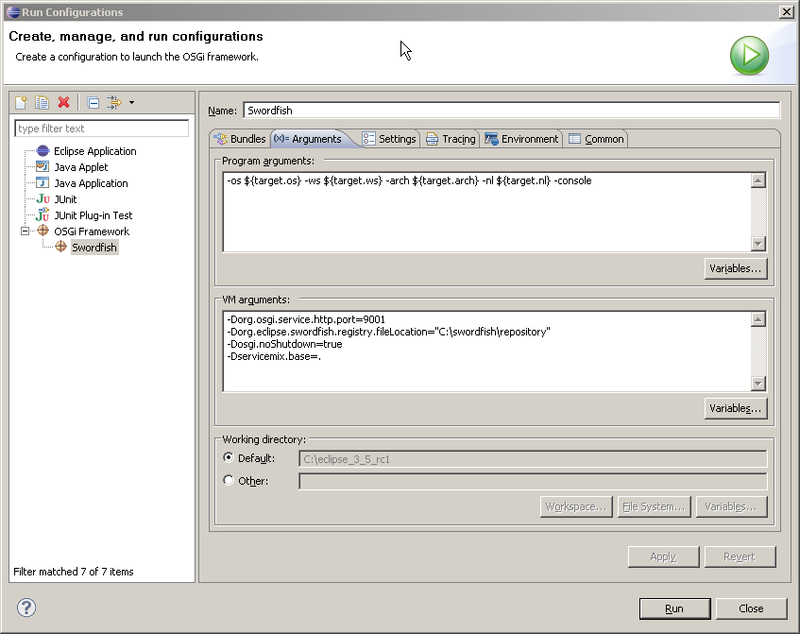 In the Run Configurations... dialog create a new OSGi configuration based on Swordfish target platform. The value of org.osgi.service.http.port must be set to 9001 - the default port that the remote resolver uses to connect to the Swordfish registry. The next property org.eclipse.swordfish.registry.fileLocation must point to the directory where all the WSDL files that need to be loaded by the registry are placed. The property osgi.noShutdown is the Eclipse Equinox (OSGI) specific container. Its value must be set to true because Equinox shuts down by default after starting up if it does not find an Eclipse application. For details on this issue, see Equinox Quick Start. The optional property org.eclipse.swordfish.registry.url can be used to point to the running Swordfish Registry instance e.g. For more information about Swordfish Registry properties, see Launching the Service Registry. You may use Swordfish samples to check if the Swordfish target platform can be successfully started. If the platform successfully starts, you see a WSDL file containing a description of the sample BookingService. This page was last modified 06:41, 30 September 2009 by Sergey Dneprovskiy. Based on work by Anne Aloysious, Andrey Kopachevsky and J and others.